Contents and Media: 91 grey injected moulded parts, 9 clear injected parts, 87 photo-etch parts, 27 resin parts, masks, 1 large sheet of decals and instruction booklet. 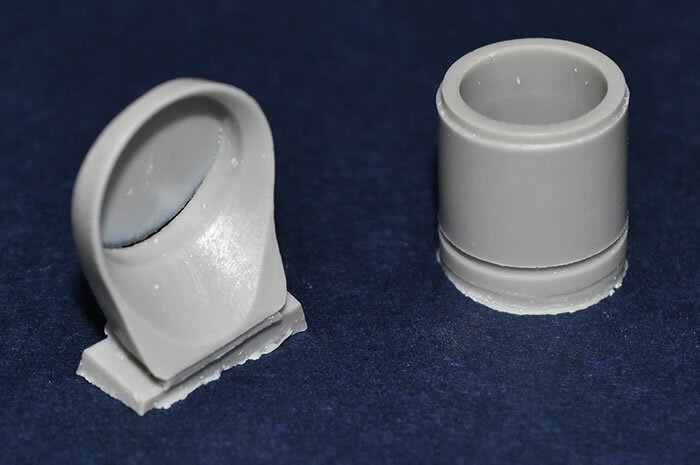 Advantages: A good quality set of mouldings, the usual Eduard etch goodies and great schemes lift the Special Hobby offering to the next level. Disadvantages: No alignment pins, some rough plastic, control surfaces not separate. 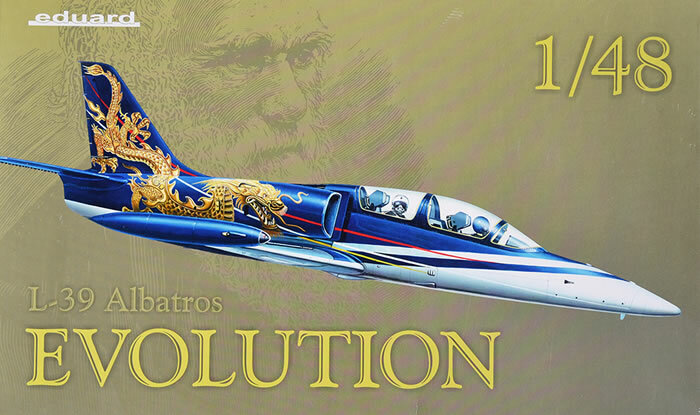 Conclusion: A good combination from Eduard with the Special Hobby L-39 Albatros plastic and their own photo-etch, masks and interesting schemes, which makes this a desirable kit. The L-39 Albatros later served as the basis for the updated L-59 Super Albatros, as well as the L-139 (prototype L-39 with Garrett TFE731 engine). 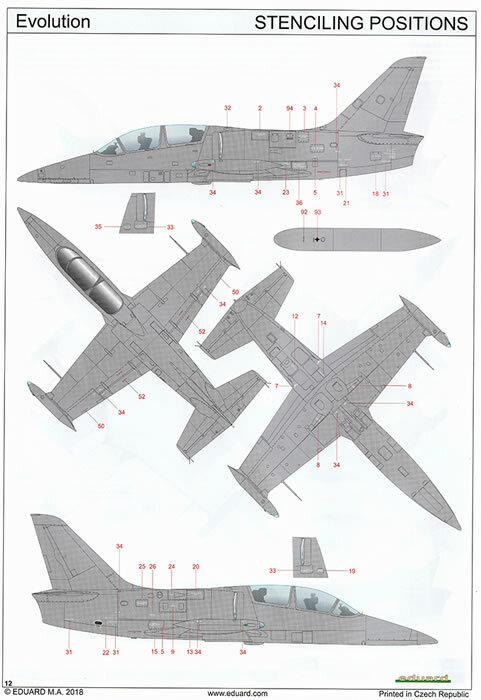 A further development of the design, designated as the L-159 ALCA, entered production in 1997. To date, more than 2,800 L-39s have served with over 30 air forces around the world. The Albatros is the most widely used jet trainer in the world; in addition to performing basic and advanced pilot training, it has also flown combat missions in a light-attack role. The design never received a NATO reporting name. The L-39 Albatros was designed to be a cost-effective jet-powered trainer aircraft, which is also capable of performing ground attack missions. For operational flexibility, simplicity, and affordability, the majority of on-board systems have been simplified to avoid incurring high levels of maintenance, as well as to minimize damage caused by mishandling when flown by inexperienced air crew. It could be readily flown from austere airstrips such as frozen lakebeds, enabled through the rugged design of the landing gear and favourable low landing speeds. The aircraft's flying qualities are reportedly simple, which is made easier by way of a rapid throttle response, making it easier for students who had never previously flown a jet aircraft before to successfully control. As a training platform, the L-39 itself comprised part of a comprehensive system which also used flight simulators and mobile ground test equipment. The low-set, straight wing has a double-taper planform, 2½-deg dihedral from the roots, a relatively low aspect ratio, and 100 litres (26 US gal; 22 imp gal) fuel tanks permanently attached to the wingtips. The trailing edge has double-slotted trailing edge flaps inboard of mass-balanced ailerons; the flaps are separated from the ailerons by small wing fences. An automatic trimming system was present, the flaps and the trim system being connected in order to counteract the potentially large pitch changes that would otherwise be generated by vigorous movements of the flaps. The tall, swept vertical tail has an inset rudder. Variable-incidence horizontal stabilizers with inset elevators are mounted at the base of the rudder and over the exhaust nozzle. Side-by-side airbrakes are located under the fuselage ahead of the wing's leading edge. The flaps, landing gear, wheel brakes and air brakes are powered by a hydraulic system. Controls are pushrod-actuated and have electrically powered servo tabs on the ailerons and rudder. A long, pointed nose leads back to the tandem cockpit, in which the student and instructor sit on Czech-built VS-1 ejection seats under individual canopies, which are opened manually and are hinged on the right. The rear seat, typically used by the instructor, is elevated slightly to readily enable observation and guidance of the student's actions in the forward position. The design of the cockpit, panel layout and many of its fittings resemble or are identical in function to those of other commonly-used Soviet aircraft; for example, the procedure for deploying the ejection seat is exactly the same as for the Mikoyan MiG-29. The cockpit is highly pressurized, requiring the air crew to wear oxygen masks only when flying in excess of 23,000 feet. A gyro gunsight for weapon-aiming purposes is typically present in the forward position only. A single turbofan engine, an Ivchenko AI-25TL (made in the Soviet Union) is positioned in the rear fuselage, fed through shoulder-mounted, semi-circular air intakes (fitted with splitter plates) just behind the cockpit and the tailpipe below the horizontal tailplane. The engine has a time between overhaul (TBO) of 1,000 flight hours; however, it is allegedly cheaper than the majority of turbine engines to overhaul. Five rubber bag fuel tanks are located in the fuselage behind the cockpit. Several heavy radio units are typically installed in an aft avionics bay; these are often removed on civilian-operated aircraft and replaced with a 70-gallon fuel tank. Additional fuel tanks can be fitted in the rear cockpit position and externally underneath the wings; the tip-tanks can also be expanded for a greater fuel capacity. The aircraft is fitted with a hydraulically-actuated retractable nosewheel undercarriage which is designed to allow operation from grass airfields. The main landing gear legs retract inward into wing bays while the nose gear retracts forward. The basic L-39C trainer has provision for two underwing pylons for drop tanks or practice weapons, but these are not usually fitted. It can be armed with a pair of K-13 missiles to provide a basic air defense capability. Light-attack variants have four underwing hardpoints for ground attack stores, while the ZA variant also has an underfuselage gun pod. Mock UB-16 rocket pods can also be installed for visual appearance only. This boxing from Eduard is another one of their blended kits. 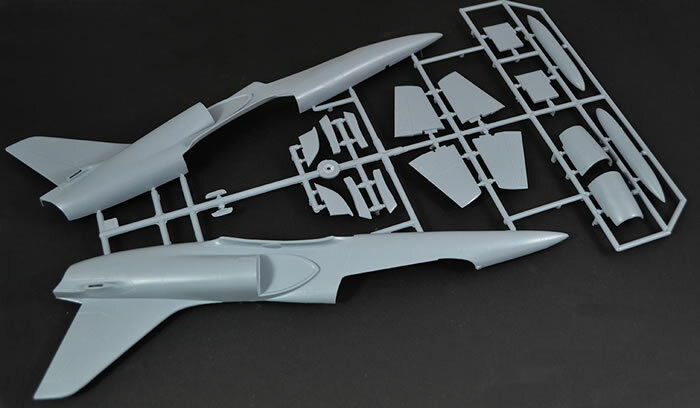 In this case, it’s the Special Hobby sprues of the elegant L-39 Albatros with 2 distinctive and very interesting schemes done by Eduard. In this case the donor model is the 2015 release of the L-39C Albatros. 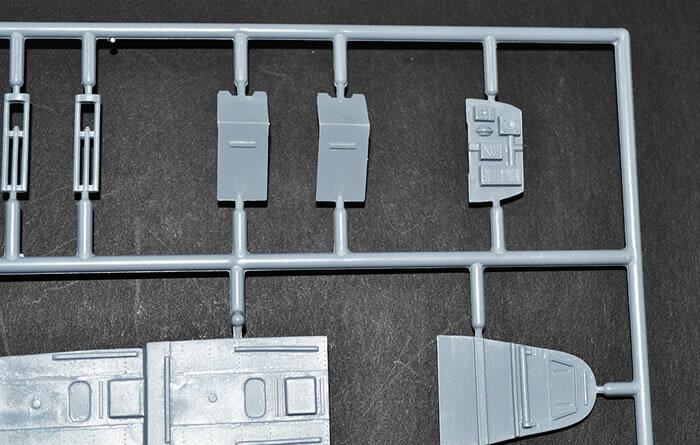 Detail on the kit is a little soft in places, and being a limited run kit, sprue gates are fairly large, some of the airframe details are simplified and control surfaces moulded in, giving you no options for positioning them without a good deal of work. 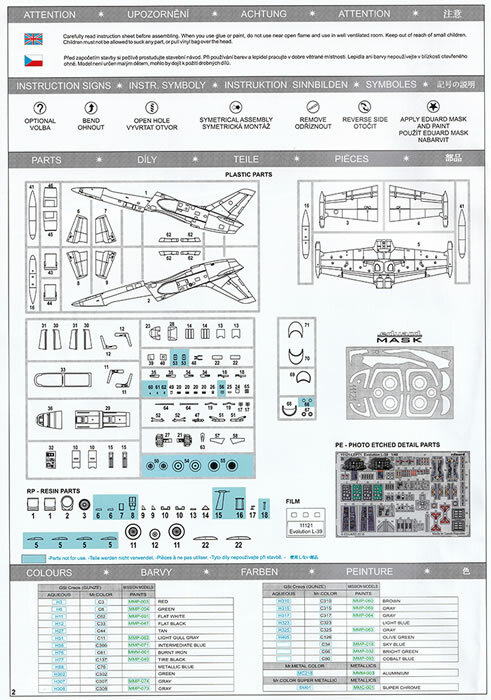 As a regular builder of Classic Airframes kits, this kit reminds me of them. A sturdy top opening box with a bright dragon clad aircraft in a prominent position greets you. 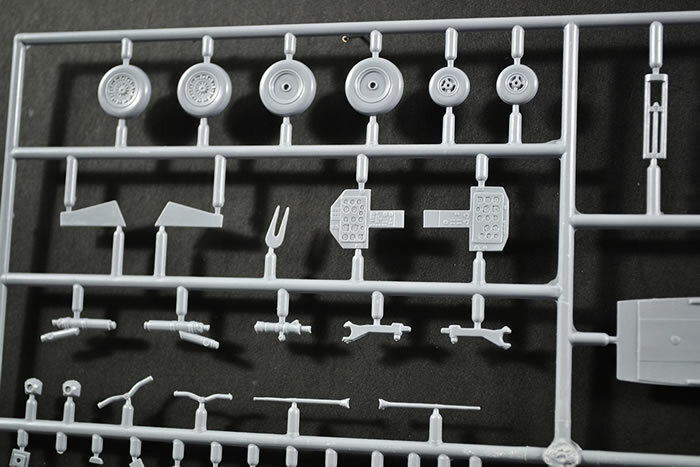 On opening, you will find three sprues containing 91 parts in light grey injected moulded parts with some minor flash in places as well as some degree of mould lines on a number of the parts, one clear sprue with 8 parts, a photo-etch sheet with 87 parts as well as 27 nicely cast resin parts to add a depth of detail to the build. 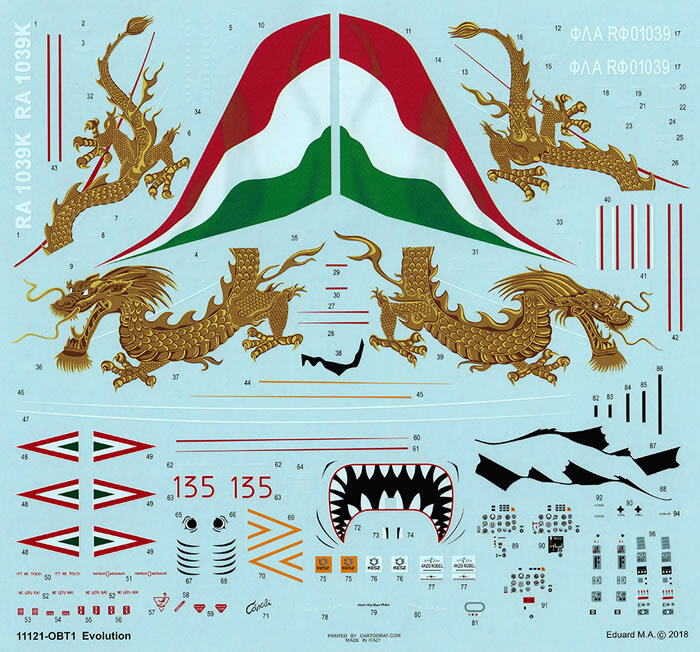 Along with this, is a decal sheet, a glossy instruction booklet with coloured profiles and decal schemes in typical well laid out Eduard style. 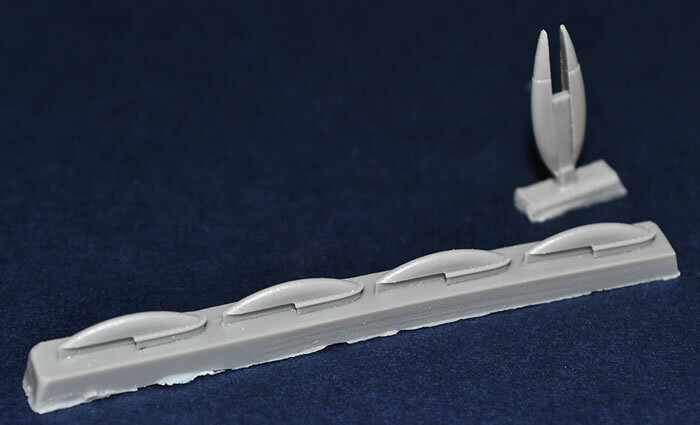 This sprue contains 16 parts with the fuselage halves being the main components on it. The detail is recessed and not too deep or shallow. Parts also have raised detail where appropriate and this combination gives you a reasonable palette to work with. The fuselage halves, tail planes, intakes and parts for one of the drop tanks are on this sprue. 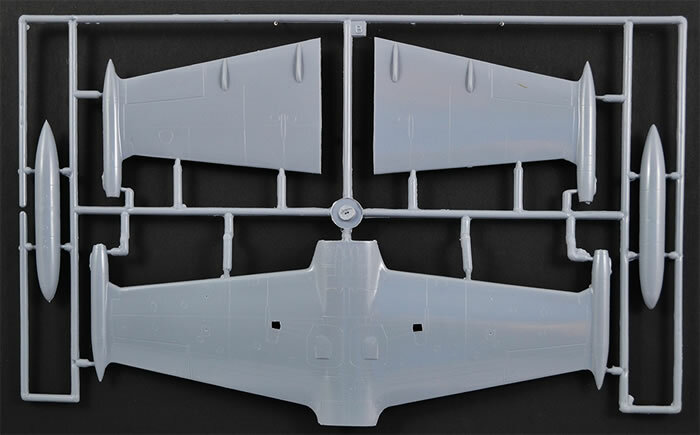 Sprue B is a simple offering with a one piece lower wing with wingtip tanks moulded integrally. 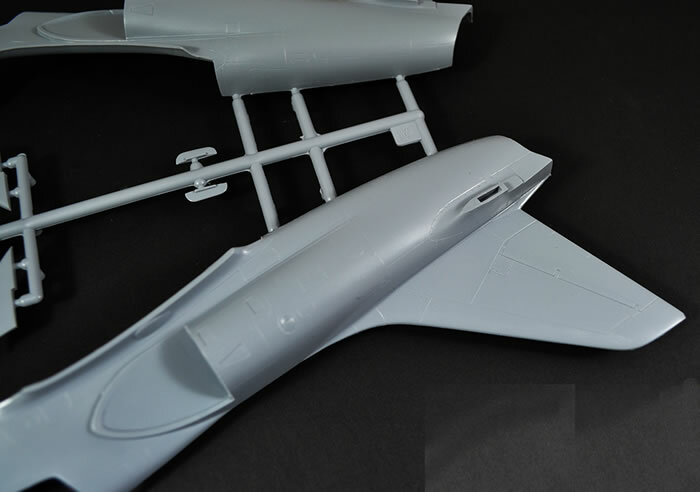 There are the 2 upper wings and parts for the other drop tank. Sprue C gives us a large busy sprue with 70 parts with 12 of these being replaced by resin offerings such as the wheels etc. It has the components for the seats, cockpit tub and associated parts, undercarriage parts and hub as well as cockpit frame and instrument panel coamings. Many parts have neat raised detail if you don’t wish to use the etch parts and with careful painting and washes will come to life. 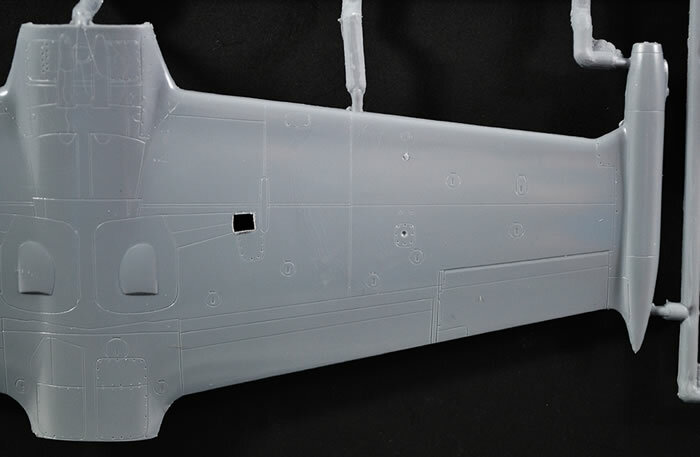 Here we have the clear sprue with the canopy sections and lights. These parts are pretty clear but the canopy sections will need cleaning up as there is a good deal of flash around the pieces as can be seen in the photo of the sprue. 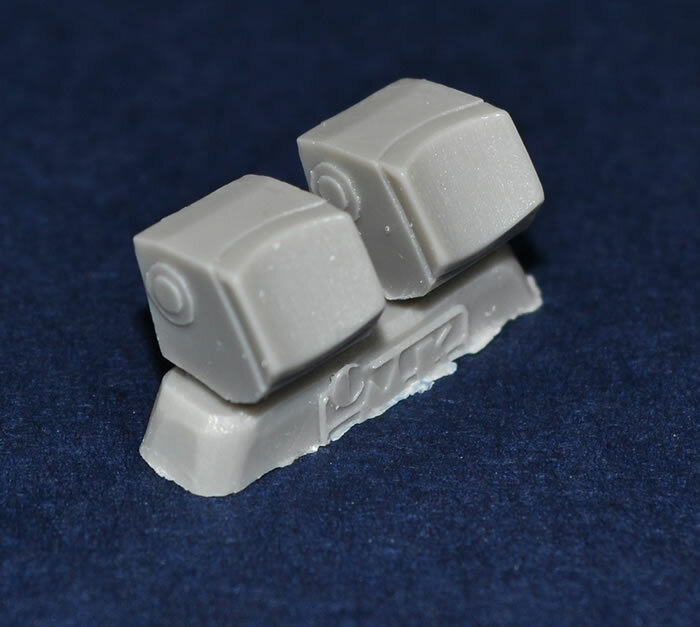 There are 27 nicely cast resin parts along with this kit which are CMK products. These include the tailpipe, head rests for the ejection seats, the wheels, addition parts for the undercarriage and a number of small aerials and avionic bumps for the exterior of the airframe. 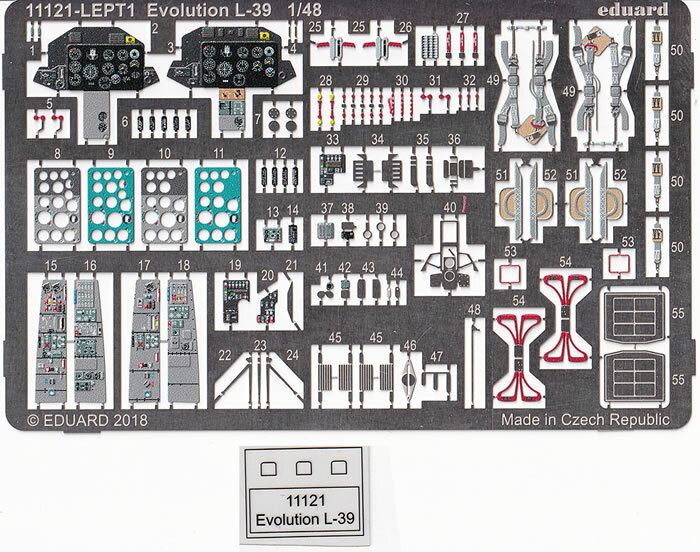 The fret is a standard sized Eduard pre-painted sheet with parts to really add to the detail in the cockpits. The cockpit area is very obvious on an Albatros, whether it is open or closed, so these etched coloured parts really lift the visual aspect of this large area. 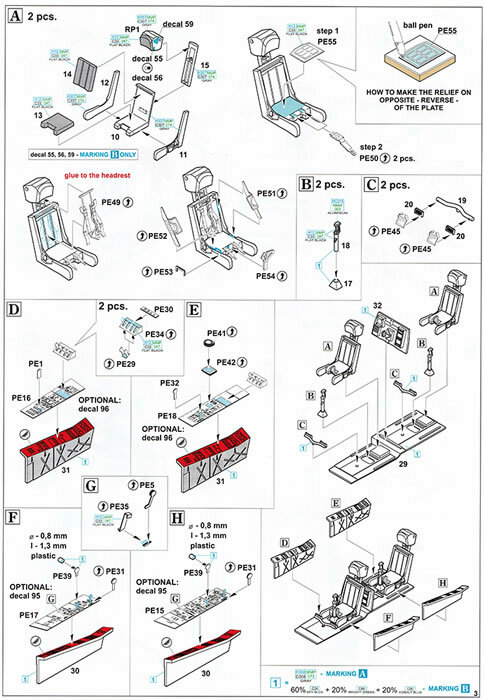 The instruction book is the usual Eduard glossy A4 booklet of 12 pages. 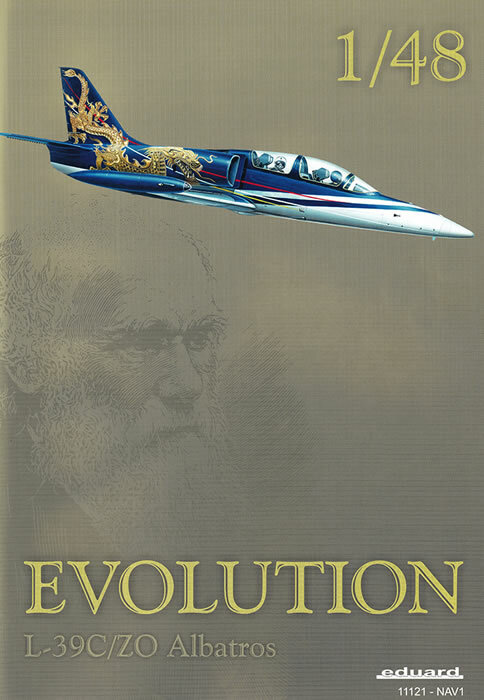 2 pages are of the schemes offered which are both display schemes with an Evolution type theme, one page of the stencil positioning with the remainder of the booklet with clearly laid out construction diagrams. Paint call outs are for Gunze paints, both Aqueous and Mr Color, and for Mission Model paints. 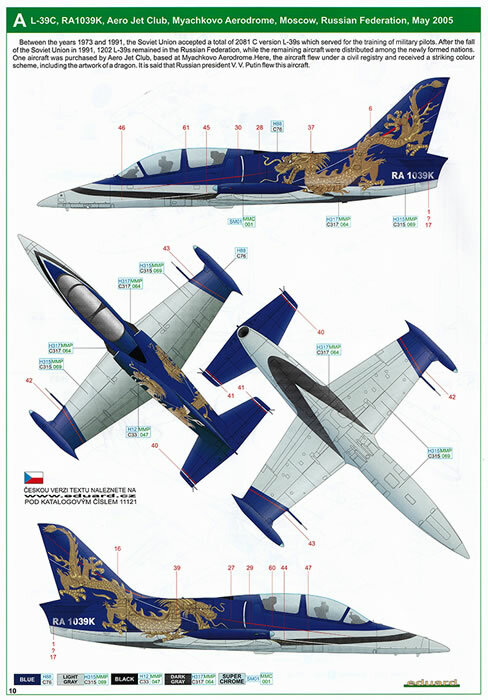 The first scheme is a privately owned aircraft in a most elegant and dazzling dark blue over pale grey with golden dragons down each side and tailplane. 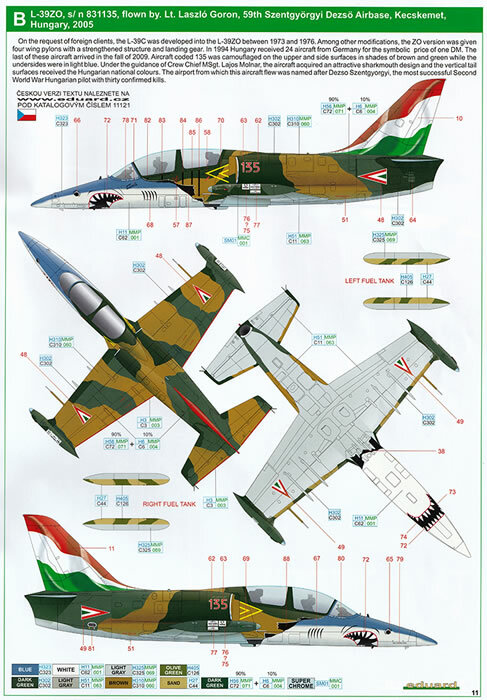 The other is a display aircraft of the Hungarian Airforce, with an overall olive/dark green/brown camouflage with the nose in blue/white for a shark look and the whole tail each side of a Hungarian flag. Both are striking schemes and will be a hard choice as to which scheme to pick. Also in the box is a set of Eduard paper masks for the cockpits and please note that there are 3 masks on the sheet that are not mentioned in the instructions. These are marked L and R and are for creating the shape of the demarcation line on the shark nose scheme between the blue/white nose and the camouflaged main airframe. These ensure that the paint and the decal match exactly. Well done Mr Eduard but I think you could have made mention of this. A very neat and well detailed kit of another smaller Eastern European trainer, of which many were made for many different countries. Eduard have supplied 2 great schemes to go with this Special Hobby moulded kit. The kit will build well and fairly quickly but be prepared to put in time and effort with both schemes. Well recommended.